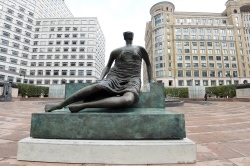 • A new exhibition charting the history of Henry Moore’s sculpture, Draped Seated Woman (known affectionately as Old Flo), has opened at Canary Wharf. Indomitable Spirit features traces the creation of the 2.5 metre high bronze sculpture in 1957-58, its placement in 1962 on the Stafford Estate in Stepney, and, in 1997, its removal to the Yorkshire Sculpture Park where it has spent the last 20 years before returning to the East End – this time Cabot Square – last year. It also explores the artist’s life, career and legacy and the reasons as to why Old Flo – part of an edition of six sculptures – became such an important feature in the East End. The exhibition can be seen in the lobby of One Canada Square until 6th April. Admission is free. For more, see www.canarywharf.com. PICTURE: Henry Moore’s ‘Draped Seated Woman’, Canary Wharf. • The first of two Peter Pan-themed weekends kicks off at the Museum of London Docklands this Saturday. Adventures in Peter Pan’s Neverland features a series of interactive events film screenings and performances across the weekend with professional character actors leading workshops and re-enacting short scenes from the story. There will also be “sightings” of Captain Hook’s pirates and other characters and two screenings of the classic animated film Peter Pan each day. Money will be raised for Great Ormond Street Hospital Children’s Charity through donations on ticket sales and other fundraising activities during the event. Runs from 10.45am to 4pm this Saturday and Sunday and again on 3rd and 4th March. Tickets start at £4. For more, see www.museumoflondon.org.uk. The origins of the name of this inner west London location on the northern side of Hyde Park and Kensington Gardens go back to at least the 14th century when it was recorded as Bayard’s or perhaps Baynard’s watering place. Bayard was the word for a bay-coloured horse but it is thought that instead the name here comes from a local landowner – it’s been suggested he may be the same Baynard whose name is was remembered in the long gone Norman fortification Baynard’s Castle in the City. The name probably referred to a site where people on their way out of or headed to London stopped for a rest and some water; the water aspect may relate to springs or to the Westbourne Stream which ran through the area. It’s now known for its culturally diverse population and high concentration of hotels. It’s also known for Georgian terraces – many of which have been converted into flats, mansion blocks and garden squares. Notable residents have included Peter Pan author JM Barrie and former PM’s Tony Blair and Winston Churchill while landmarks include Whiteleys, a department store which first opened in the mid 19th century (and was later rebuilt after burning down). In this, the final in our series on historic sporting events in London we take a look at the first time the Peter Pan Cup was presented at the annual Serpentine Swimming Club’s Christmas Day race in Hyde Park. While the origins of the annual 100 yard Christmas Day day race – and the club itself – go back to 1864, it wasn’t until 1904 that author JM Barrie (writer of Peter Pan, or The Boy Who Wouldn’t Grow Up and later knighted), first presented the Peter Pan Cup to the race’s winner (Peter Pan was first performed at the Duke of York’s Theatre the same year). Previous winners had received a gold medal. Barrie’s involvement apparently came from the fact that he lived nearby in Bayswater and had often seen the swimmers. 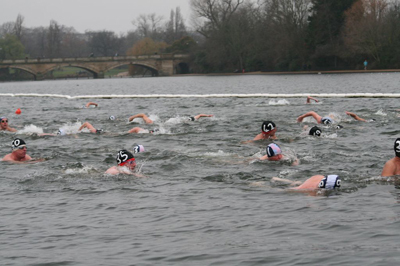 The race, which starts at 9am on Christmas Day on the south side of the Serpentine near the cafe, is only open to club members (so don’t turn up expecting to be able to join in) and operates on a handicap system (pictured are swimmers in the 2009 race). Last year’s winner was Neil Price. It’s worth noting that while this is the club’s most famous event, members swim every weekend throughout the year. For more on the Serpentine Swimming Club, see http://serpentineswimmingclub.com/. 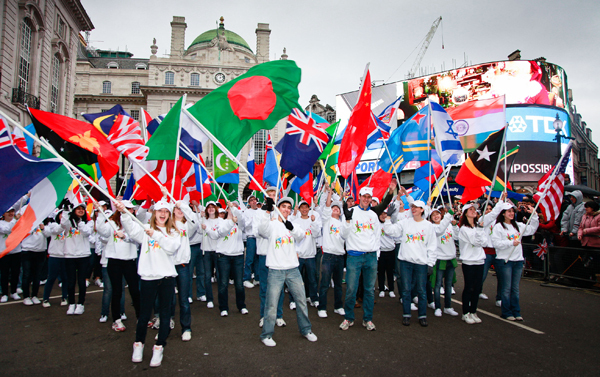 More than 8,500 performers – including those pictured celebrating the launch of London’s Olympic year – took part in this year’s New Year’s Day Parade in London, the wettest in the event’s 26 year history. But the wild weather didn’t put off the more than 500,000 people who turned out to watch the parade as it made its way from the starting point outside the Ritz Hotel in Piccadilly via Trafalgar Square to Parliament Square. As many as 19 London boroughs submitted entries in a competition based on the themes of the Olympics and the Queen’s Diamond Jubilee with Merton (its entry ‘From Horsepower To High Speed Rail’ featured animatronics) and the City of Westminster (its entry ‘Peter Pan’ involved a giant galleon and the The Sylvia Young Theatre School) announced as joint winners. For more on the parade, see www.londonparade.co.uk. It’s now one of the most popular statues in London – the diminuative “boy who wouldn’t grow up”. But few people today are aware of its somewhat unusual origins. Located about half-way along the western shore of the Long Water in Kensington Gardens, the bronze statue first “appeared” in the park in 1912. The story goes that author JM Barrie, who published his first story about Peter Pan – The Little White Bird – in 1902, chose the location of the statue based on it being the place where, in the story, Peter Pan landed after flying out of the nursery window of his home. 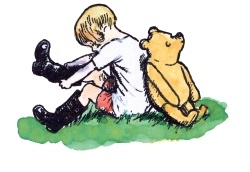 Peter Pan first appeared on stage two years later in 1904 in the play Peter Pan, or The Boy Who Wouldn’t Grow Up, and this was later expanded into a novel by Barrie, Peter and Wendy. He’s since appeared in numerous film and stage adaptations – including sequels and prequels to the original tales. 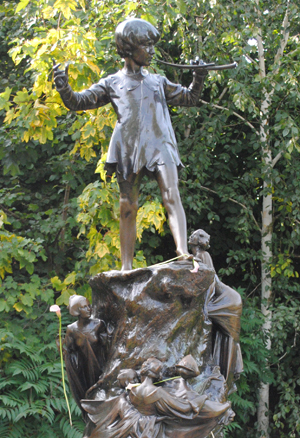 Barrie had apparently been thinking about the statue for some time prior to its appearance – in 1906 he went so far as to take a series of photographs of six-year-old Michael Llewelyn Davies wearing a Peter Pan costume (it was Barrie’s relationship with the Llewelyn Davies family which is said to have inspired Peter Pan’s creation). Six years later Barrie commissioned Sir George Frampton to create the statue – interestingly, in what was a cause of some friction between the artist and patron, Sir George modelled his figure not on Llewelyn Davies but on another boy. Peter is seen playing on some pipes and is surrounded by small animals and fairies. There’s no sign of Captain Hook. On the 1st of May, the statue simply appeared in its current position after being taken into the park under the cover of darkness. Barrie announced what he called his “May Day gift” to the children of London in The Times newspaper, describing it as “delightfully conceived”. There was apparently some initially concerns raised among MPs about the appropriateness of an author erecting a statue to promote his own work but it has since become an iconic symbol of the gardens (and undergone some repairs – including after an incident in 1952 when Peter’s pipes were stolen). So popular has the statue proved, that copies of the Peter Pan statue – created using Sir George’s mould – can now be found in Liverpool as well as in countries including Canada, Brussels, Australia and the US. There are others (not copies) in Kirriemuir, Scotland (Barrie’s birthplace) and another of him with Tinkerbell outside Great Ormond Street Hospital for Children (which holds the copyright to the character).